I had an assignment this semester in my English class to write a research paper. We could pick any topic, so I chose Weight Stigma and Bias. I feel proud of what I wrote, so I want to share it here in a blog post. It is a long paper with a lot of references, so be prepared. Here we go! Weight stigma and weight bias refer to the prejudice, discrimination, and stigma experienced by individuals based on that individual’s weight. This discrimination can happen in every facet of life including employment, education, healthcare, relationships, and the media (Lee & Pausé, 2016; Puhl & King, 2013; Phelan et al., 2015; Washington, 2011; Puhl & Brownell, 2001; Blodorn, Major, Hunger, & Miller, 2016; Carr & Friedman, 2005). Individuals can experience stigma and bias through bullying, shaming, and discrimination. According to the Binge Eating Disorder Association, “Weight stigma depends upon three basic suppositions: thin is always preferable, thin is always possible, and thin people are better people,” (Pershing, 2013). This is known as the thin ideal and it is socially and culturally validated by the media, clothing stores, furniture and architectural design, etc. The media promotes the thin ideal on extreme weight loss television such as The Biggest Loser and Extreme Weight Loss where contestants are put on unhealthy extreme diets and exercise routines to lose drastic amounts of weight in short time spans. In the case of The Biggest Loser, contestants are shamed for their weight through forcing contestants to wear barely-there outfits to weigh-ins and yelling at contestants throughout the competition, especially during workout scenes, to “inspire” them to exercise and lose weight. This idea that shame can promote weight loss is especially present in the show despite research showing stigma and shame result in the opposite effect including weight gain, ill health effects, and negative psychological consequences (Pearl, Puhl, & Dovidio, 2014; Nolan & Eshleman, 2016). Additionally, following the show, most contestants regain a significant amount of the weight lost and show signs of metabolic slowing with those contestants with more long-term weight loss showing greater metabolic slowing (Fothergill et al., 2016). This is because of the dangerous, unhealthy, and unrealistic tactics used in the show to promote weight loss. The thin ideal is also promoted in the media using ultra-thin models in magazines and runways. The average American women is a size 16-18 (Christel & Dunn, 2016) while the average fashion model is much smaller and growing even smaller over time from weighing 8% less than the average women twenty years ago to weighing 23% less in 2012 (Jones, 2012). Even the size of plus fashion models is decreasing from averaging between a size 12-18 ten years ago to a size 6-14 in 2012 (Jones, 2012). The average size of a fashion model has decreased in size despite research suggesting that average-size models are more effective and do not have the same negative effect on body dissatisfaction (Diedrichs & Lee, 2010; Diedrichs & Lee, 2011; Bartlett, Vowels, & Saucier, 2008; Dittmar & Howard, 2004). These differences can be seen when comparing models in older magazines to those today. Research suggests that the thin ideal and the media negatively impacts individuals. In a study of adult women by Grabe, Ward, and Hyde (2008) on body image concerns and the media, the study found a correlation between exposure to the media and the thin ideal and body image concerns. These results were similar in study by Field et al. (1999), who studied this effect in girls. In the Field et al. (1999) study, “The frequency of reading fashion magazines was positively associated with the prevalence of having dieted to lose weight, having gone on a diet because of a magazine article, exercising to lose weight or improve body shape, and deciding to exercise because of a magazine article,” (p. 3). The negative effects of the media were also present in a study by Barlett, Vowels, and Saucier (2008) who studied the media’s effect on men and found the men in the study felt pressure from the media and this pressure correlated with negative body image. These studies support the idea that the media and the thin ideal have a deleterious effect on viewers. The thin ideal in the media is also present in social media. In a study conducted by Mingoia, Hutchinson, Wilson, and Gleaves (2017) on the relationship of social media and the thin ideal found a positive correlation between social media use and internalization of the thin ideal. Mabe, Forney, and Keel (2014) in their study of Facebook use and disordered eating found that increased Facebook use was correlated with greater disordered eating. Both studies show the negative effect of social media on its users with correlations between the use of social media and body image. Fashion further reinforces that thinness is the ideal through clothing retailers. In the US, clothing sizes in the average women’s clothing retailer range from 0-12/14 (straight size) with plus size starting at 14/16. The average women’s clothing retailer does not make clothes for the average woman. The average woman instead must shop at retailers who carry plus size clothing, which can be hit or miss. Simply because a retailer carries plus-size options does not mean that those options are fashionable, stocked, or priced the same as straight size even within the same store (Banjo, 2016; Bellafante, 2010; Cheng, 2017; Hanbury, 2017; Reagan, 2015). However, there is reason for hope. The plus size market is continuing to see a growth in annual sales and the growth is larger than that of straight sizes (Banjo, 2016; Hanbury, 2017; Reagan, 2015). While there may be a growth in sales, a widespread change in the industry has yet to happen. This sizing for smaller bodies is also present in furniture design. The design of seating, for example, is not always created to accommodate larger bodies (MacVean, 2010; Park, 2012). This is present in restaurant booths, chairs with arms, and airplane seats where larger bodies may or may not fit. This reinforces and promotes the idea that all bodies must fit a certain size. Though there is change occurring in the industry with increasing options for accommodating furniture (MacVean, 2010; Park, 2012), the industry still has a long way to go, especially in regards to airplane seats, which are shrinking in size rather than increasing (Associated Press, 2017; White, 2017). This culture of thinness and shame creates even more shame and stigma. From 1995-1996 to 2004-2006, discrimination based on weight increased the most when comparing weight/height, race, age, gender, and ethnicity discrimination rates (Andreyeva, Puhl, & Brownell, 2008). In that study, weight-based discrimination increased the most over that time span. There were comparable results in a study by Latner and Stunkard (2003), who studied the stigma of childhood obesity. The study showed children various drawings of children from healthy to disabled to obese and compared the reactions from 1961 and 2002. The results of the study were that children in both 1961 and 2002 liked the drawing of the obese child the least and the bias against the obese image increased from 1961 to 2002 (Latner & Stunkard, 2003). And yet people are not getting any thinner. The weight of adults and children has increased from the 1980s to the 2000s (Flagel et al., 2002; Ogden et al., 2006). People are subscribing to this thin ideal and turning to things like the weight loss market to avoid the stigma and shame with being overweight (“U.S. Weight Loss Market To Reach $58 Billion in 2007”, 2007). The more people weigh, the more weight stigma there is. The more weight stigma there is, the more people weigh. In a study done by Stevens et al. (2016), “…an increase in BMI was associated with a significant increase in lifetime weight stigmatization,” with “…weight status directly affect[ing] psychological outcomes.” Weight stigma begets weight stigma. In a study by Ashmore, Friedman, Reichmann, and Mustante (2008) on the correlations between weight stigma, psychological distress, and binge eating behavior, the results suggested that weight stigma predicts psychological distress and binge eating behavior. Comparable results are found in O’Brien et al. (2016) who studied the relationship between weight stigma and eating behavior. The O’Brien et al. study found, “…weight stigma was significantly associated with all measures of disordered eating, and with weight bias internalization and psychological distress,” (p. 70). These results of weight stigma correlating with psychological distress and eating disturbances are consistent throughout the literature (Stevens et al., 2017; Nolan & Eshlemann, 2016; Vartanian & Porter, 2016; Puhl & King, 2013; Thompson et al., 1995; Stice, Marti, & Durant, 2011). The consensus from these studies is that weight stigma has negative consequences. The negative psychological consequences of weight stigma and bias include body image dissatisfaction, depression, anxiety, suicide ideation, and other psychological issues (Puhl & King, 2013; Durso & Latner, 2008; Ashmore, Friedman, Reichmann, & Mustante, 2008; O’Brien et al., 2016; Vartanian & Porter, 2016). These negative psychological effects can result in internalization of the stigma and declines in physiological health including causing unhealthy eating habits and eating disorders (Culbert, Racine, & Klump, 2015; Durso et al., 2011; Durso & Latner, 2008; O’Brien et al, 2016; Webb & Hardin, 2016). Weight stigma’s negative impact on body image and eating behaviors are supported by eating disorder research, which suggests a correlation between weight stigma and body image dissatisfaction and eating disorders (Culbert, Racine, & Klump, 2015; Stice, Gau, Rohde, & Shaw, 2017; Stice, Marti, & Durant, 2011; Thompson et al., 1995). In a study done by Stice, Marti, and Durant (2011), “…body image dissatisfaction was the strongest predictor of risk of onset of any eating disorder,” (p. 7). Though the research suggests a correlation, none of the studies referenced found any causation. Weight stigma and bias exist because of the thin ideal. The thin ideal is socially and culturally validated, which reinforces weight stigma and perpetuates the negative physical and psychological effects of this unattainable ideal. Men, women, and children all face negative consequences because of the thin ideal and weight stigma. Perhaps if the thin ideal was debunked and denounced, individuals would no longer suffer from the negative effects and one risk factor of eating disorders would be eliminated. Ashmore, Friedman, Reichmann, & Musante. (2008). Weight-based stigmatization, psychological distress, & binge eating behavior among obese treatment-seeking adults. Eating Behaviors, 9(2), 203-209. Associated Press. (2017, July 29). ‘Incredible shrinking airline seat’: US court says seat size a safety issue. The Guardian. Retrieved from https://www.theguardian.com/business/2017/jul/29/incredible-shrinking-airline-seat-us-court-says-seat-size-a-safety-issue. Blodorn, Major, Hunger, & Miller. (2016). Unpacking the psychological weight of weight stigma: A rejection-expectation pathway. Journal of Experimental Social Psychology, 63, 69-76. Diedrichs, & Lee. (2010). GI Joe or Average Joe? The impact of average-size and muscular male fashion models on men’s and women’s body image and advertisement effectiveness. Body Image, 7(3), 218-226. Diedrichs, P., & Lee, C. (2011). Waif goodbye! Average-size female models promote positive body image and appeal to consumers. Psychology & Health, 26(10), 1273-1291. Fothergill, E., Guo, J., Howard, L., Kerns, J. C., Knuth, N. D., Brychta, R., Chen, K. Y., Skarulis, M. C., Walter, M., Walter, P. J. and Hall, K. D. (2016), Persistent metabolic adaptation 6 years after “The Biggest Loser” competition. Obesity, 24: 1612–1619. Nolan, & Eshleman. (2016). Paved with good intentions: Paradoxical eating responses to weight stigma. Appetite, 102, 15-24. O’Brien, Kerry S., Latner, Janet D., Puhl, Rebecca M., Vartanian, Lenny R., Giles, Claudia, Konstadina, Griva, Carter, Adrian. (2016). The relationship between weight stigma and eating behavior is explained by weight bias internalization and psychological distress. Appetite, 102, 70-76. Stevens, S., Herbozo, S., Morrell, H., Schaefer, L., & Thompson, J. (2017). Adult and childhood weight influence body image and depression through weight stigmatization. Journal of Health Psychology, 22(8), 1084-1093. Vartanian, & Porter. (2016). Weight stigma and eating behavior: A review of the literature. Appetite, 102, 3-14. Yufe, S., Taube-Schiff, M., Fergus, K., & Sockalingam, S. (2017). Weight-based bullying and compromised peer relationships in young adult bariatric patients. Journal of Health Psychology, 22(8), 1046-1055. I heard that you will be appearing on the Biggest Loser to promote your Drink More Water campaign. At first, I was shocked and frustrated. I wondered why you would promote a campaign for healthy choices and behaviors on a show that only promotes unhealthiness, unattainable weight loss, and weight shaming and bullying. But then I started to feel sad. I felt sad because I know what it is to experience weight-based stigma and bullying and how for me that turned into a deadly eating disorder. I used to watch the Biggest Loser when it first started. Back then I was very overweight and hated my body. I watched every week as these contestants lost incredible, impossible amounts of weight while being screamed at. I thought, ‘Why can’t I lose that much weight?‘ I tried and tried and failed. I could not understand why I could not “motivate” myself through the punishment/bullying model I watched on the Biggest Loser. I had no idea at the time that it was not a way to lose weight. I only knew that I was desperate and would do anything–anything–to lose weight. I believed after experiencing weight-based stigma, shame, and bullying throughout my entire adolescence, only that would work to make weight loss permanent and that I had to lose the weight and be thin in order to be good enough and loved. There was no other option. It was out of this desperation and body-hate that my life took a disastrous turn. It was only after I stopped watching the Biggest Loser that I started to really lose weight. It was in a healthy way at first with small, doable, and mindful changes. It was a slow but steady process. However, it was not long before unhealthy behaviors took over. I followed the Biggest Loser’s model for motivation and weight loss and bullied, shamed, and hated my body in order to lose more and more weight as fast as I could. Combined with my obsessive compulsive disorder (OCD), it developed into an eating disorder. Due in part to sources such as this show, I overexercised, purged, and restricted all in the hopes of never feeling the pain and despair again and feeling instead that if I were thin, I would be lovable and good enough. I chased that dream nearly to the grave because I never knew that loving yourself was possible if you were not thin or that you were good enough just as you are. I thought that, like on the show, if I was fat, I deserved to be treated badly. To this day, I fight back demons telling me I am not good enough, thin enough, lovable enough, tall enough, etc. However, as I have discovered in my journey of recovery, it is of paramount importance to love and accept yourself and that neither health nor worth is determined by a number on a scale or the size of your clothes. I make a conscious effort daily to remind myself of that. First Lady Obama, shows like the Biggest Loser that promote body-hate and shame. The trainers constantly yell and scream at their trainees and shame them into continuing to workout. It is the stereotypical abusive relationship–they abuse, they come back, explain why it was in the best interest of the abused to be treated that way, and then they do it again. Sadly, the media seems to believe this is the right way to get people to lose weight and that has influenced what so many of my peers believed would “work” too (or maybe they simply enjoyed poking fun at my body). It is shameful. What people do not realize and what I did not realize is that it does not “work”. Instead of teaching the contestants to love and accept themselves and strive towards true health, these trainers shame them for being fat, “losing control” of their eating and weight, and set them on a series of unhealthy behaviors and unrealistic weight loss. The participants are not taught that they are beautiful for who they are, just that they must to lose weight. It is truly a flawed show. Additionally, the Biggest Loser portrays each contestant in a grotesque manner. For example, during every weigh-in, each wears nearly nothing as if to shame them even more because their bodies are on display for all to see. Simply, the Biggest Loser ensures the contestants feel shame and hate towards their bodies. I hope you reconsider appearing on the Biggest Loser because the nature of the show is so unhealthy and based in weight shame and bullying. Promoting health and wellness deserves a national stage that includes body acceptance and love to facilitate healthy living, not a life based in fear or shame. It is only then that we can start making a change so that individuals like me do not have to go through so much body hatred and shame and turn to eating disorders in order to attempt to no longer be “fat” and be subjected to the bullying we endure daily. Please, First Lady Michelle Obama, do not appear on the Biggest Loser. 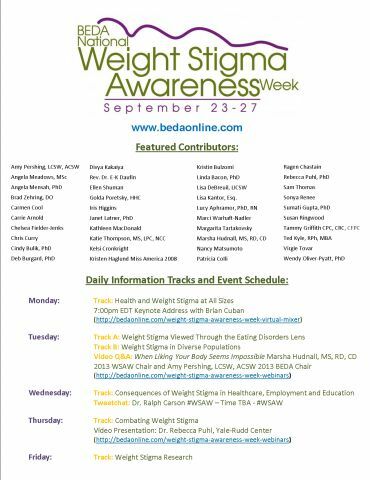 This week is the Binge Eating Disorder Association’s (BEDA) Weight Stigma Awareness Week. I am so grateful to be included in this event amongst some of the most amazing people as a Featured Blogger. I encourage all of you to check out all of the posts and events throughout this week and the Keynote Speaker, Brian Cuban, tonight. It is a fantastic lineup of posts and events that I know will touch, inspire, and fascinate everyone. I cannot express to you how excited I am! Weight Stigma is such an important topic to discuss. So many people are affected by weight stigma every day through judgements or stereotypes, bullying, biases, and discrimination. It is a very real problem with very real consequences. Words are not simply words and we must all be mindful of the way we treat each other, fat or thin or “average sized”. In the end, a person’s weight or size means absolutely nothing about who a person is, how healthy they are, how smart they are, or anything. It is simply the body in which a person inhabits. Weight Stigma is also not necessarily an external thing. One of the things in my personal journal, which I wrote about and will be posted on Thursday, is that weight stigma can be an internal stigma. After years of feeling external weight stigma, I internalized the negative things that were being said to me and the overwhelmingly negative messages I was hearing about being “fat”. That internalization still affects me today. I very much encourage all of you to read the posts, participate in the events and talks, and whatnot. It is/will be an amazing and inspiring week. To check out the entire event and all the posts visit this link: BEDA.